A blue-chip, multinational corporation has successfully implemented SPREO’s smart office technology with the aim of improving efficiency, collaboration and workspace utilization amongst its workforce. The deployment includes multiple company campuses and will be expanded worldwide in 2018. Marking a strong growth spurt in 2017, SPREO continues to enable companies to boost productivity and employee experience through location-aware solutions, integrated with business efficiency tools. Among its most common integrations, SPREO connects with enterprise-wide resource booking systems and mail exchange systems. 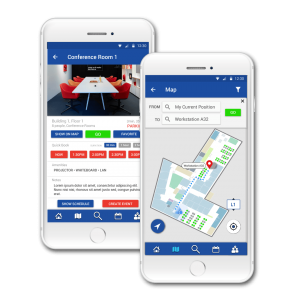 The mobile app allows users to effortlessly book resources such as conference rooms and workstations from their mobile devices before navigating to them on a digital campus map. Users may also share their live indoor location with colleagues, allowing the company to collect valuable occupancy and utilization analytics. Since GPS signals cannot be received indoors, SPREO’s solution relies on the latest in IoT technology: Bluetooth Low Energy (BLE) beacons, which are deployed throughout the campus and help determine the X and Y coordinates of each user on the map. These advanced integration capabilities have positioned SPREO as the leading indoor location solution provider for corporations for digital wayfinding, workplace efficiency, location sharing, dynamic office collaboration and more. SPREO brings digital innovation to the modern office with a centralized mapping engine, employee mobile app and integration with facility and resource management tools. SPREO’s cloud-based, location-aware IoT platform and comprehensive CMS deliver a highly scalable, agile and cost-effective platform for asset and personnel tracking (RTLS), corporate efficiency, resource booking, secured location sharing, navigation, mapping, geo-fencing, proximity engagement applications, site analytics and more. SPREO is headquartered in New York City with R&D labs in Israel.